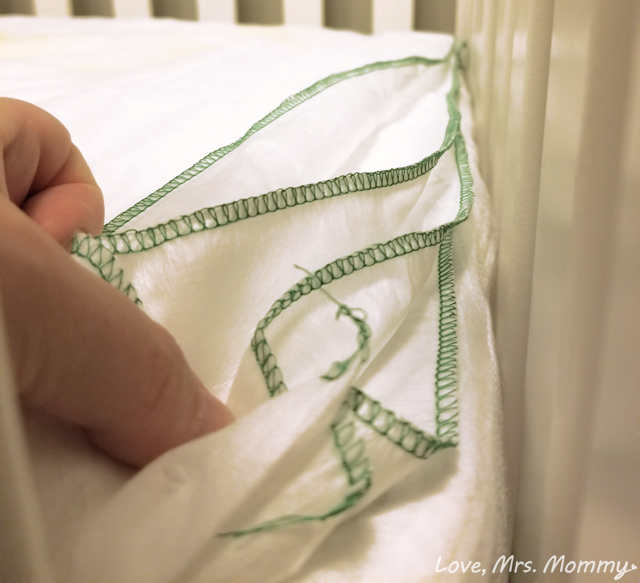 Love, Mrs. Mommy: Crib-A-Peel Makes Crib Changes in the Middle of the Night a Breeze! 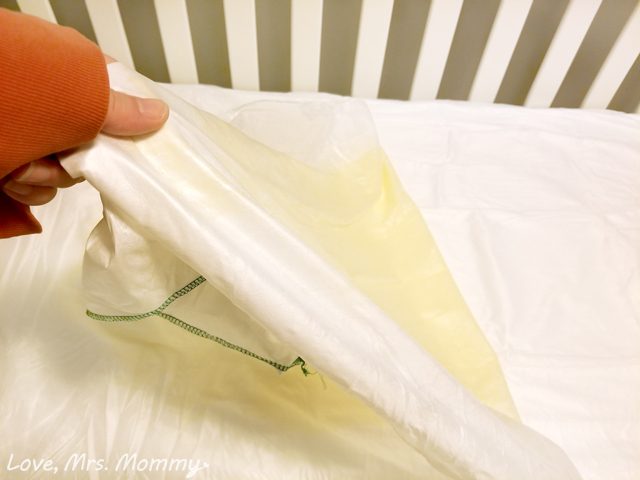 Crib-A-Peel Makes Crib Changes in the Middle of the Night a Breeze! 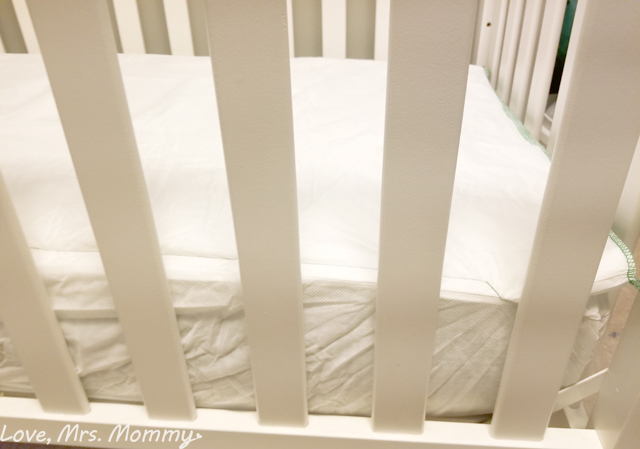 Jen received Crib-A-Peel disposable fitted mattress pads at no cost to complete her review. All opinions are her own. Thankfully, Wallace hasn't had many leaks yet (knock on wood). I'm sure they are coming when we get to potty training, but for now I’m thankful that I don’t have to deal with them that often. The mattress pads fit the mattress nice and tight, so I didn't have to worry about them being too loose and becoming a hazard to Wallace. Peel Away Labs specializes in sheets. The multi-layered, peel-away, waterproof disposable sheet product allows quick removal of each layer, and a fresh, clean, soft sheet is immediately in place underneath. Peelaways are independently laboratory tested and are free from phthalates, formaldehyde, and lead. I love that! 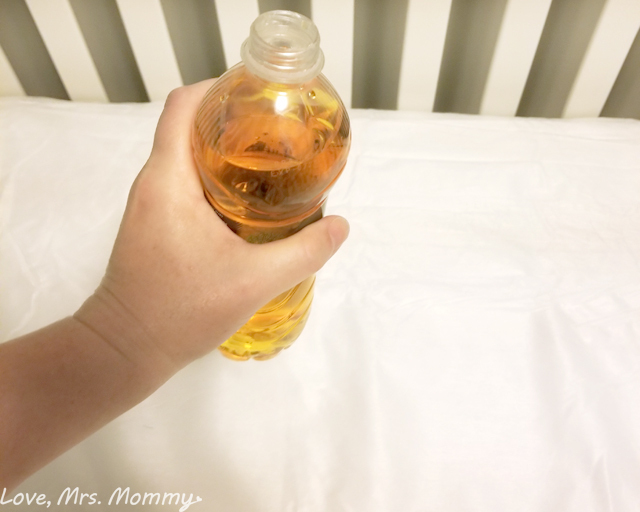 I filled my water bottle with colored water, and poured almost all of it onto the Crib-A-Peel mattress pads. I should have moved the water around more, because once it absorbed, it all just sat in small pool. I ended up having to grab a small towel to pat up the small pool of water. The excess did start to follow a small wrinkle in the pad and started dripping off the edge of the mattress, which I also had to clean up. The picture below shows the area it absorbed after I cleaned up the excess. I followed the instructions and grabbed the top layer while holding down the bottom layers. It was a little tricky to get started, but mainly because I was afraid of tearing the seam and trying to take pictures of the process. At this point, I was doubting that these pads actually worked. I was sure it must of went through all 5 layers of the pads and still left water on the mattress. I started by pulling the top layer back and then just needed to pull till it started tearing. This was the defining moment, were these pads going to work, or would I need to remove layer after layer only to still end up cleaning up a mess? Boy, was I pleasantly surprised! There was a completely dry layer underneath! No leak through at all! I was shocked and are absolutely loving these! I continued tearing the whole layer up and was able to just toss the mess. How easy! I can see these being super useful for any middle of the night leaks or accidents! Just tear a layer off and put on a new crib sheet. 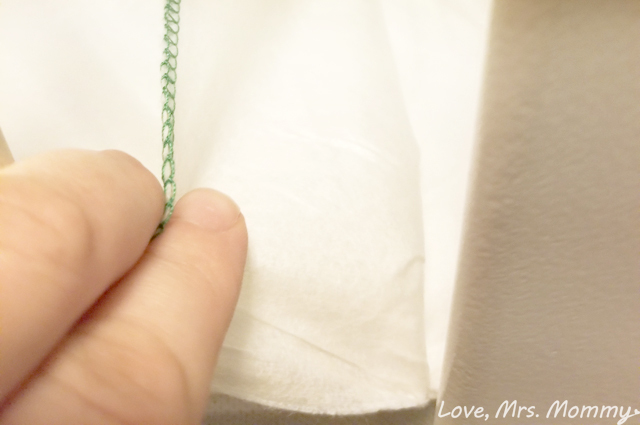 No need to also change a mattress pad until you get to the last one of the pack. I’m planning on saving these for potty training just because we’ve been lucky with so few leaks otherwise. Best of luck to all those on their potty training endeavors. Just remember, Crib-A-Peel is there to help you along the way! 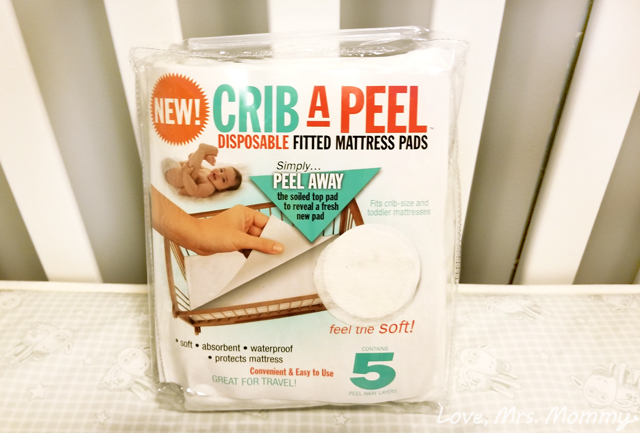 Connect: Find out more about Crib-A-Peel and their other great products by checking out the Peel Away Labs website. Then make sure you “like” them on Facebook and follow them on Twitter. 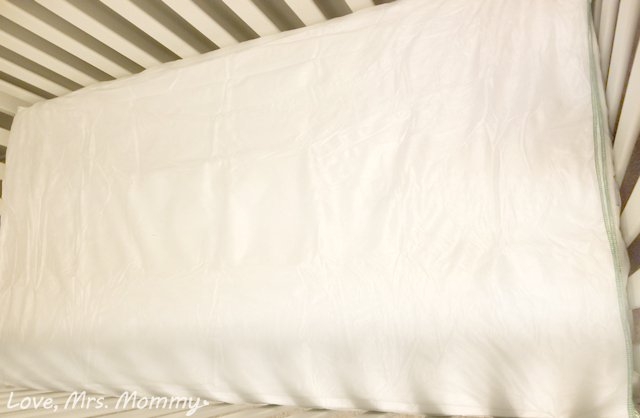 Buy It: You can purchase Crib-A-Peel waterproof fitted mattress pad on their website. Wow, those are really waterproof. These are a great idea for a new mom. Thanks for posting! I think these are a great idea!Perfect for new parents! A friend of ours is having a baby end of this month. What a great gift idea for her! This is a super good idea, and can be a game changer especially for grandma and grandpa would would babysit! These would be a huge help and time saver! That's so great, and saves a lot of time! Great invention! Wish we had these back in the day. My niece is expecting. I'll tell her about these. I wish they had these when my son was a baby! These are a great idea!! Thanks for sharing!! Very nice post & ideas. I wish these were available 20 years ago when my kids were babies. Sounds interesting--my daughter-in-law might be interested in trying these for my 6 wk old grandson. Good review--thanks! No muss, no fuss, that's for me. What a great way to protect the mattress. This would be great for new parents. These would be a great plus when the kids are sick. Nice review. These are a fantastic idea. I like how easy hey look to use. What a handy product! I like that they really held up to your test! Would be a very useful item. This would be great to have for the new baby that is on the way this May. I am going to be a grandma again! Wow these are crazy! perfect for a daycare full of babies. These would have been perfect when mine were babies! wow, this is awesome! i know what im getting my pregnant friend! Awesome! Where were these when my boys were babies!!!??? How cool!!! I wish they would have these when my kids were babies! It's so hard to get enough rest with an infant as it is. No one wants to have to changes everything in the crib with a middle of the night booboo. Wow! What a great invention! I can't believe there was no leaking. Love all the innovative things that have come out since I had my baby. I no longer have babies but if I did, this product would certainly be of interest! This would definitely help parents and their babies get back to sleep after a nighttime accident! This would've been nice to have when I had babies! This would have been nice to have when my girls were newborns!! This is a great idea. I would love to try these out. I wish I'd known about this when mine was a baby! Great idea, who wants to change everything when accidents happen especially in the middle of the night. Wow, I can see this being useful too! Good idea! What a wonderful idea! Are these compostable or recyclable? I wish we had had this when our daughter was a baby. I love the idea. This is a lifesaver for all parents out there. Such a cool product.